Sage Leaf Rockrose is the rockrose of choice for medium hedges. 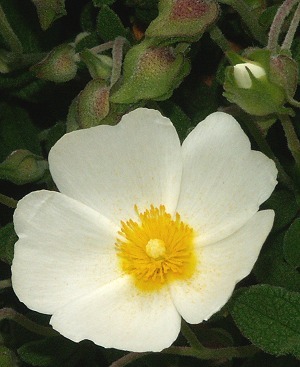 Attaining a height of two to three feet over many years, it is one of the shorter, more compact Rockroses. Covered with snow white flowers in spring, Sage Leaf Rockrose makes a gorgeous addition to any Mediterranean garden. In the photo below, Sage Leaf Rockrose is front and center. 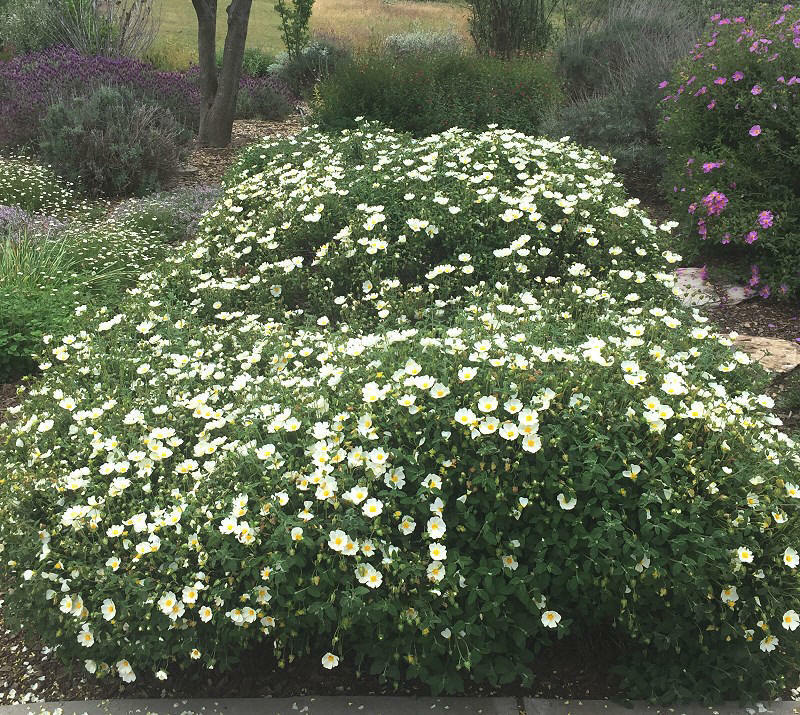 To the left is the delightful Santa Barbara Daisy that starts blooming early and blooms until hard frost. The gorgeous purple flowering bush way in the back is Spanish Lavender which is the earliest blooming lavender we grow. Off on the right is Cistus incanus or Pink Rockrose which is one of the taller rockroses and just as beautiful and prolific a bloomer as the Sage Leaf Rockrose. Rockroses drop their flowers at the end of each day and open hundreds of new ones the next day. They are extremely drought tolerant but look nicer when kept hydrated. Rockroses can be pruned into shapes or left to run wild.